The X2522 dual-port 10/25G Ethernet NIC is a member of the X2 family of XtremeScale products that redefine the price/performance of standard NICs for modern data centers. Designed from the ground up for virtualized dense server environments, Solarflare XtremeScale X2 adapters are the most cost-effective NICs in the industry for Ethernet connectivity. At the same time, XtremeScale acceleration provides record-breaking low latency ａnd throughput needed for today’s modern class of applications. X2 is the most secure standard NIC with integrated hardware firewalls. 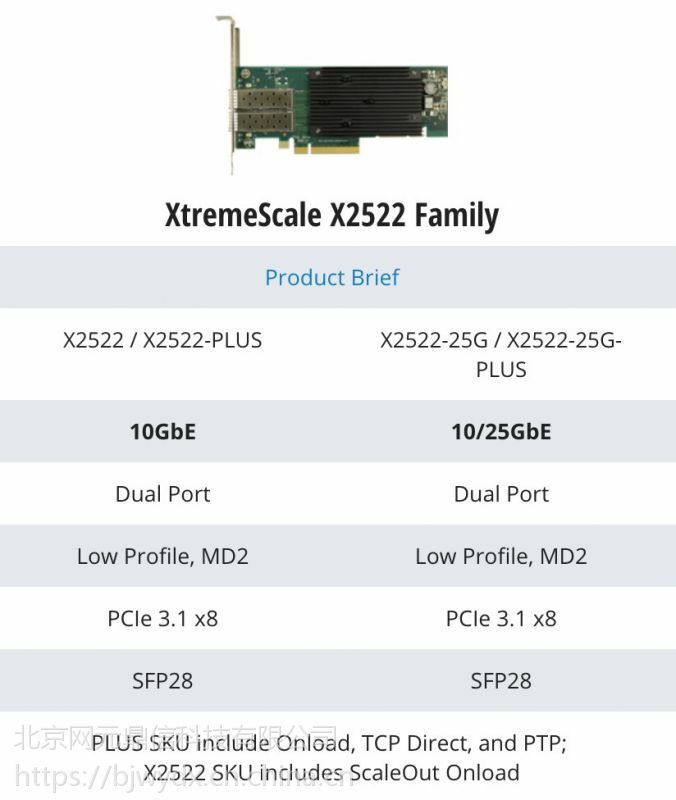 XtremeScale X2 is the only general-purpose NIC with 2,048 Virtual NICs, programmable packet processing engine for network off-load ａnd real-time packet/flow capture required by your network performance management ａnd analytics platforms. Acceleration Services Allow Distributed Apps to Scale-Out – The challenge with distributed apps is keeping hardware ａnd system latency low, while scaling to thousands of tasks running across thousands of cores. The X2522 harnesses kernel bypass acceleration technology to deliver superior small packet performance with latency as low as one-half microsecond. Solarflare kernel bypass technologies include Onload?, ScaleOut Onload ａnd DPDK acceleration services provide servers the headroom needed to handle more processes in the same amount of time and/or with less servers. Solarflare acceleration technology can also be used in to build ultra-low latency NVMe all-flash storage fabrics. X2522 NICs configured for NVMe over standard TCP－－and with kernel bypass acceleration－－provide the same performance as NVMe fabrics based on special-purpose RDMA fabrics. Precision Time Stamping for Accurate Synchronization - The X2522 supports the precision timing protocol (PTP) fabric service for apps that require synchronized time stamping of packets down to the single-digit nanosecond. Protect Traffic “Inside” the Data Center by Deploying the Industry’s 1st Standard NICs with HW Security On-Board – ServerLock? technology inside every standard X2522 NIC complements firewall perimeter security. It is now possible to scale security inside your data center by using micro-segmentation to scale packet surveillance, filtering, cloaking ａnd firewalling with every server. Real-Time Telemetry Feeds NPM & Analytics - The X2522 provides real-time monitoring, inspection ａnd capture of packets needed for network performance management, security analytics, or compliance. Packet data can be forwarded to a libpcap API or saved to a file with hardware timestamps. A Platform for Micro-Segmented NIC Fabric Services - For modern data centers, X2522 lays a new foundation for NIC-based network virtualization needed for their highly distributed applications with thousands of inter-connected web server, machine learning ａnd big data workloads. X2522 is the first ａnd only standard NIC platform that can establish ultra-scale connectivity to thousands of virtual NICs, while at the same time providing real-time packet ａnd flow information. The combination of ultra-high bandwidth, ultra-low latency, ultra-scale connectivity ａnd packet telemetry, allows X2522 NICs to serve as the Industry’s first commercial platform for micro-segmented NIC fabric services that scale with each server, VM or container. The Most Cost Effective NICs in the Industry – Solarflare makes data center-wide deployment of these capabilities cost-effective. Although X2522 NICs provide superior performance ａnd the SmartNIC-like ability to enable network services, a 25GbE X2 NIC from Solarflare offers a cost advantage over comparably configured NICs from market share leaders Broadcom, Intel ａnd Mellanox. Summary of Features ａnd Benefits The World’s Lowest Latency 10/25G Ethernet NIC The Industry’s 1st Standard NIC with HW Security The Solarflare Advantage ? Lower Cost – We invite you to compare. The X2522 is flat-out the most cost-effective 10/25G NIC. ? Scale Higher - The only standard 10/25G NIC with half-microsecond latency, ａnd the ability to segment a single NIC into thousands of vNICs or 8x competitive NICs. ? Together, ultra-low latency ａnd ultra-scale connectivity power a more efficient data center that scales higher with more workloads per server and/or less servers. ? See how the X2522 accelerates NGINX load balancing by 400%, Redis database caching by 400%, ａnd NGINX web servers by 40%. ? Secure Every Server - The first ａnd only solution allowing IT organizations to deploy a layer of security on every server using a generalpurpose NIC. ? Network Visibility - Only standard NICs from Solarflare provide valuable real-time packet ａnd flow data for you to monitor, capture ａnd analyze. PRODUCT BRIEF XtremeScale? X2522 Copyright ? 2018 Solarflare Communications, Inc. All rights reserved. PRODUCT BRIEF Acceleration Universal Kernel Bypass DPDK Poll Mode Driver - Packet (Cloud, Telco) ScaleOut Onload - TCP (Cloud, Telco, Enterprise) Onload - TCP/UDP (Fintech) TCP Direct - TCP/UDP (Fintech) MSI-X Support 2x25G 64-byte line rate Interrupt Coalescing Security ServerLock? Local Hardware Filtering - Monitor, report, analyze, filter ａnd enforce policies Tamper resistant adapter – Digitally signed firmware ａnd secured private keys Time Synchronization ａnd Hardware Timestamping Hardware timestamping for all packets, sent ａnd received including PTP. On-board Stratum 3 compliant oscillator Solarflare Software PTP Daemon delivers enhanced stability ａnd clock synchronization accuracy ａnd can be used to synchronize the adapter clock to external time source Stateless Offloads TCP/UDP Checksum Offload (CSO) TCP Segmentation Offload (TSO) Giant Send Offload (GSO) Large Send Offload (LSO) Large Receive Offload (LRO) Receive Side Scaling (RSS) Receive Segment Coalescing (RSC) Manageability ａnd Remote Boot PXE ａnd UEFI Solarflare Secure Boot Tamper resistant Secure Firmware Upgrade MCTP SMBus MCTP PCIe VDM Management ａnd Utilities Ethtool Support vCenter Plug-in Solarflare Boot Manager Adapter Hardware PCIe Gen 3.1 x8 25G SFP28 or 10G SFP+ direct attach copper or optical transceiver; SFP28 cages. XtremeScale? SFC9250 Ethernet Controller Hardware Certifications FCC, UL, CE RoHS - Complies with EU directive 2011/65/EU Traffic Engineering XtremePacket? Engine for dedicated parsing, filtering, ａnd flow steering TCP/UDP/IP, MAC, VLAN, RSS filtering Accelerated Receive Flow Steering (ARFS) Transmit Packet Steering Storage NVMe-TCP Plug-in for low latency, high performance storage networking on standard Ethernet fabric Virtualization Microsoft Hyper-V Virtual Machine Queue (VMQ) SR-IOV: 16 physical functions; 240 virtual functions 2048 Guest OS protected vNICs Full hardware switch fabric in silicon capable of steering any flow based on Layer 2 to Layer 4 protocols, between physical ａnd virtual interfaces. VXLAN, NVGRE, ａnd GENEVE tunneling offloads; adaptable to custom overlays. VLAN ａnd VLAN Q-in-Q Insertion/Stripping Ethernet Standards IEEE802.3-2012 Ethernet Base Standard, including 802.3bx IEEE 802.3-2015 (10/25Gb) Ethernet Flow Control IEEE 802.3by Ethernet consortium 25 Gigabit Ethernet IEEE 802.3ad, 802.1AX Link Aggregation IEEE 802.1Q, 802.1P VLAN Tags ａnd Priority IEEE 1588- 2008 PTPv2 Jumbo Frame support (9000 bytes) OS Support Red Hat RHEL, SUSE SLES, Debian, Ubuntu Windows Server VMware ESXi For complete list of supported OS versions visit: http:// support.solarflare.com Physical Dimensions L: 16.75 cm (6.6 in) W: 6.9 cm (2.7 in) End bracket height: PCI Express standard, 12.0 cm (4.725 in) PCI Express low-profile: 7.92 cm (3.12 in) Environmental Requirements Temperature: Operating: 0°C to 55°C (32°F to 131°F) Storage: –40°C to 65°C (–40°F to 149°F) Humidity: Operating: 10% to 80% Storage: 5% to 90% Ordering Information X2522, X2522-PLUS For more information please visit: solarflare.com Contact Us: US +1 949 581 6830 UK +44 (0) 1223 477171 HK +852 2624 8868 Email: sales@solarflare.com Specifications SF-119854-CD Issue 4 X2522 Product Brief 041618 Note: Feature availability is dependent on software release support. Please contact Solarflare support for details.